Review by AllTheBestFights.com: 2015-08-23, some good shots between Francisco Trinaldo and Chad Laprise but it is not enough to get three stars: it gets two. Francisco Trinaldo entered this fight with a mma record of 17-4-0 (59% finishing rate) and he is ranked as the No.36 lightweight in the world. He lost to Michael Chiesa last year but then he has won three consecutive bouts beating Norman Parke in his last one (=Trinaldo vs Parke). His opponent, the undefeated Chad Laprise, has a perfect record of 10-0-0 (50% finishing rate) and he entered as the No.46 in the same weight class; he has already fought once in 2015 winning over Bryan Barberena. 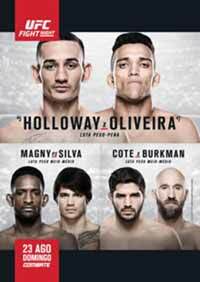 Trinaldo vs Laprise is on the undercard of Max Holloway vs Charles Oliveira – UFC Fight Night 74. Watch the video and rate this fight!